This interview took place on: 4/19/09. Jesus freak Hideout (John DiBiase): So, now why again the television aspect of your album title, Five-Two Television? KJ-52: I think a TV network represents so many aspects of what you can see. And I think we are a visually driven culture right now, or period - I think we are just gonna stay that way. So, I thought if our whole world is wrapped up in networking and visually seeing all this and reality shows ... what if I could paint a picture that would allow you to focus in on one particular story. So, the record will actually play through, you'll actually hear this guy's story being played out. So, instead of just being able to listen to it, you'll actually be able to download all these videos that are done as a video blog. JFH (John): For every song? KJ-52: Not for every song. They will be like the interludes. So, you will literally see this guy - it's like he's in rehab and being forced to write a journal. So he is just in front of this camera ... and so you are watching his story play out through the record. So we're gonna just start it at one point on the actual physical product to hear the extenuation of the story you have to go download the other record. That's the record that you give away. Of course, again, this could be me completely over thinking and probably doing too much as usual and it will just have a cool, funny skit. Nah - I don't know. I'm just saying, but the idea was that I'm already doing a lot of visually based stuff, I thought why not just take this to the record. JFH (John): So, besides Trevor McNevan (from Thousand Foot Krutch), do you have any other guests lined up for the record? KJ-52: I have multiple, multiple guests ... the only one who I actually have confirmed with and who I have a verse from, is a guy named Braille - he is an underground hip hop guy, Braille Brizzy. He hopped on a song I did called "Headlines." We took headlines from the news, combined them with headlines from our head, to talk about the headlines that were on Christ's head. So, it's like a multiple angled thing. So, like my verse is like, "Until you know the deal, I'm gonna keep rocking 'til I reflect the light like the four-headed Dr. Phil. You, know ... Christ, my healer, paid the doctor bill, made my sin disappear like David Copperfield," - and then it just goes on through, ya know ... "When I think about all the pain He felt, it leaves my head swimming like the brain of Michael Phelps." Little things like that. So, it's just pulling all these, ya know ... headlines, to tell this. JFH (John): Is there a specific song that you're just totally jazzed about? KJ-52: I like "End of My Rope," because it was the first recording ... it was one of those songs where I wrote the chorus, I sang on the chorus, but I wasn't like trying to do the chorus ... and it just sounded better with me on it. So, that was kinda cool to be able to dig into that. But there's another song called "Mirror." And it's the idea of ... I tell the story of a guy who struggles with what he looks at and sees in the mirror. And I reveal that at the end of the song, it was me. And, that's the idea of going, "What do you see in this mirror?" So, ya know ... I don't want it to just be more of the same, typical KJ ... but there is some things that I just felt like I needed to talk about, and deal with, and bring to the surface, and we'll see where it goes from there. It's hard to talk about the record, because I'm like literally halfway through it. So, it could take so many different directions ... but there's a few joints in there that I'm pretty amped about. JFH (Amy DiBiase): I read a quote recently somebody posted, I believe it was probably legit - I think it was quoted by Theadore Roosevelt, and it said, "When you get to the end of your rope ... tie a knot ... and hang on." But then, when you said that you just have to learn to let go - I mean really, yeah, let go! KJ-52: That was the idea of just basically saying trust ... that's the chorus, "I'm at the end of my rope, I'm losing my hope, I'm about to let go" ... it's a double meaning. It says, I'm about to let go because I can't hang on anymore ... but that's literally when God steps in and goes, "Now that you have given up - I'll take it from here." And that was the first thing that me and Aaron [Sprinkle] started talking about in the studio. We had no idea what we were gonna do. We just sat down and he started sharing with me this story, and I think he actually said, "It was when I got to the end my rope, that's when I let go." Whatever he said, I suddenly went ... that's it! That's the song! That's the first song. And I wrote it that night. JFH (Amy): And that quote I heard - that didn't bring any encouragement to me at all, because I'm like, 'I don't want to be hanging on the end of a rope...' I mean - that's fearful. Ya know, I found much more hope in what you said. KJ-52: Yeah, there's so much better we could be doing. That's actually the first lines that came to me, was it says, "I'm lost at the end of my rope, and I'm burning, I'm yearning, I'm hurting for hope. I'm needing this burden to go, but I'm searching for purpose, searching to know ... it knocks me down to the floor, 'til I'm pounding the ground and I'm down in my hope. It got me down to the floor, 'til I cry out to you, I can't take it no more." And the final thing that I say, is "Crush me, mold me, break me - 'til I ain't just the same me ('til I'm not the same person) ... You're the only one who's my safety." So it's more of a prayer, but it's also part of the whole thing. It's just one of them things that just, ya know ... the music sorta spoke it into existence. JFH (Amy): Have you ever been to a rehab facility? KJ-52: I haven't ... but I've had multiple friends ... okay, here's the deal - that's where it kinda came from - someone telling me their rehab story. Well, that actually is what sparked most of that ... was me talking with somebody who was in an Alcoholic's Anonymous meeting. But, the other thing that was is I actually hit, after that period - hit a writer's block ... and couldn't come up with anything. And I went back and stayed in my old neighborhood for two days. And that began, literally this next phase of the record. JFH (John): So, you're constantly moving - you're doing the new album, the podcast, the devotionals and just everywhere ... Twitter and stuff. So what's your secret? Starbucks? KJ-52: You know what? Funny you would say that ... this darn recession's got me like doing a complete financial revamping. So, me and the wife both had to go down to like Starbuck's debit cards. So, I've learned how to home brew. I didn't stop drinking [coffee]… I just home brew. KJ-52: Yeah ... I mean, like - I think I tweeted one time, "These pancakes and coffee are amazing." I was feeling the moment. It was a good day! JFH (John): So, where did you get the inspiration and idea to start up the "Freestyle Fridays?" KJ-52: I was trying to think of something that was interactive ... so, I realize that I was really getting a reaction on Twitter. The fastest reaction to anything I would get was through Twitter. And I thought, I already do these freestyles ... I do them at shows ... I said, 'the biggest podcast I always have are ones that are music related in that sense.' I said, 'well ... maybe this will work?' The main thing that finally made it happen, it that I got an app for the iPhone that allows me to basically record myself and broadcast it live. So, that's how I was able to finally then self-contain. I mean, that's really the only way that I can pull off all this stuff, is cuz of this thing *holds up his iPhone*. So, that was mainly it. JFH (John): So is Apple paying you anything for this commercial? Like you are doing for the iPhone? KJ-52: They need to be! It's not fair. No ... but, I know I couldn't have done all this before. Like, the Bible study I launched, was all through the iPhone. It was totally recorded, I do all my tweets - ya, know ... "Hey, ya'll - I'm sitting here at GMA ... make sure you check out today's audio Bible study." Bam. JFH (John): Can't get any easier? Can it ... Unless someone else does it for you. KJ-52: And I don't have that person yet ... and I'm probably too controlling to ever have someone. KJ-52: Yeah ... and there is a personal, like, this is the first record, I was able to take the channel that I do, that's the live video feed - I took it in the studio. So, we had a live video feed the whole time I was in there with Aaron. So, to be able to be literally working on a song, and looking in the chat room and say, "He should really turn that snare up." Ya know ... oh, wow - this is whole new world. But it does give you a whole new connection, that made me go try and be able to do what I do better. JFH (John): So, then, do you plan the Bible studies? KJ-52: I prerecorded them. And then I put them up on my podcast page. So, they launch themselves every day. So, I don't ever have to really launch them. I don't even really need to tweet about them ... I just do it, because I know people join me at different times. So, a kid that's just new to me, suddenly goes, "Oh, wow ... KJ's got a Bible study." So, that was kinda why I did it. Now, I've actually now been doing the video ones and recording them. I'm stock-piling them all, for the book of Matthew. So, the next phase will be video. KJ-52: No, no no… I have an actual curriculum I'm using. The Assemblies of God do a thing called "Fire Starters" ... so I've been using theirs. 'Cuz it's part of my partnership with them to some degree. So, I just use their already-existing [curriculum] but I put my own spin on it. So whatever they have ... they have like 4 million different things you can go with… I just honed in on one thing and go, "This is what I get out of this." But, it still gives them notes that they can read - and it's just one less thing for me to do. The great thing is, too - like, I've just done multiple ... the last week, I have done three of the Assemblies of God Youth conventions ... so for me to now stand up and go, "Hey, how many of you guys have the Fire Bible?" I'll go, "well, I have my own audio Bible study ... you can go and download it." But, it's not about a denomination ... it's not denomination specific. JFH (Amy): What is a "Fire Bible?" JFH (John): It is literally on fire as you read it ... and you have to wear these special gloves. JFH (Amy): It comes with like, an extinguisher??? KJ-52: If you can go through Mark before you burn down ... you can get a prize. JFH (John): Or you could get a KJ-52 record for free! KJ-52: Nah, it's just the NIV Bible with just notes. That's really it. It just has their notes. JFH (Amy): Well, where do you buy this? KJ-52: You can't ... they give them away for free. But, you can get all the notes. They actually gave them away at their conventions. I'm trying to think of where you can get one. That is a real good question. I think it's honestly, all they did is repackage the "Spirit Believer's Bible" ... I think that's all they did. I think they repackaged the "Spirit Life Bible" ... I can't remember the name of the one they had. They just kinda repackaged it and threw the notes on it. I just lost my Bible at the last youth convention, thank God for the iPhone app! But, you could actually get all these... it's all available. It's free stuff. They have literally Fire Bible notes for every book. They're already up there. So, you could literally use any Bible to do it. And that's kinda why I honed in on it - cuz it really didn't matter what you had. Not unless you have -- and this is one I've actually found -- it's called "The Bible According to Four Brothers." It was in like, 70's slang, jive talk. Yeah, it was like, "and Jesus said, 'Don't diss me my man ... you jive turkey.'" It was literally written like that. I'm serious! I promise. This friend of mine, this was years ago, he had it. He was a Seventh Day Adventist minister, down in Huntsville, Alabama, and he had "The Gospel According to Four Brothers." It was the Bible translated into slang. It was so bad. "Don't diss my man, you jive, Pharisee cat." It was literally like that! I'm like, "are you serious?!" JFH (John): So, what do you hope to do with the Tweezy blog? KJ-52: The Tweezy blog was just more having a centralized location, ya know? Cuz I couldn't centralize everything on my website. It wouldn't feed correctly, and I couldn't upload everything to my website from my phone. The Tweezy blog is nothing more than a Tumbler web page. And I just have a Tumbler app, so I can upload everything to the Tumbler and it syncs to my MySpace, it syncs to my Twitter, it syncs to my website. I just needed one central thing that I could run from my iPhone. And then I just called it Tweezy blog, because it's easier to go ... "So, what's your blog page?" Ahhhhh ... KJ52tumbler ... my podcast page is the same, I just changed the name to KJ52podcast, cuz it was easier to remember. JFH (John): So, going back to "Stuck in the 80's" ... ya know - the video for that was pretty sweet. What's your favorite 80's movie? KJ-52: Oh, dude ... that's without a question - Breakfast Club. There's just no ... ah, yeah ... A close second would be Ferris Bueller's Day Off ... maybe Say Anyhing. Ya know, "I gave her my heart, she gave me a pen." That's a pretty amazing quote right there. But, no ... Breakfast Club, which is ironic - because when it came out, I was way too young to be full of teen angst ... but going back, yeah - that's the top John Hues movie for me. KJ-52: That's gonna be ... oh, if it's animated, then no question! Robotech and Voltron, it's anime. It's a very obscure cartoon. But, it was like ... yeah ... it was the forerunner for most anime stuff. Non-anime ... the funny thing is, I've gone back and watched all those shows that I loved - and I realized how bad they really were. They're not that great. I was a big A-Team fan, Silverspoons, Airwolf (solving crimes in a helicopter) ... only in 1980-something could you do that. MacGyver was okay ... mainly because he had hair that I ascribed to have, that I could never have. I struggled with that. Different Strokes was pretty good. I'm trying to think... there was probably some teen angst show that I probably watched more regularly - it would probably be late 80's ... Fresh Prince was okay, it was cool ... but I wasn't a Will Smith fan, so I was like laughing. JFH (John): How about, then, 80's music? Favorite band, or song? KJ-52: Oh, no question ... The Police. It would probably go Police… for me? The top 5 ... it would probably go… I'm so embarrassingly into "yacht rock" ... Michael MacDonald, Holland Oats, Phil Collins - anything you could like see a guy sitting on a yacht... like "yacht rock." Like "This is It" - "ain't no mistake where you are. The waiting is over." Big hair. I was gonna go see Hall and Oats on Tuesday. Tickets were too expensive. But yeah, Hall and Oats, Phil Collins, the Police ... I probably listen to every day, at some point. JFH (Amy): What cartoon do you find that you can somewhat respect, that your son watches? Even if it's a little respect. KJ-52: He just started getting into Bob The Builder. And ... I can't front - that Bob The Builder theme song is pretty hot. It's a pretty good Bob The Builder theme song. He is not really into cartoons yet. He likes trucks ... so, we rented him all these truck movies, Cars, just driving - for days. He's not 2 yet, he's still not even 2. He's been bombed out by visual images. He's probably gonna have multiple ADD. This kid is all about the trucks. Trucks. 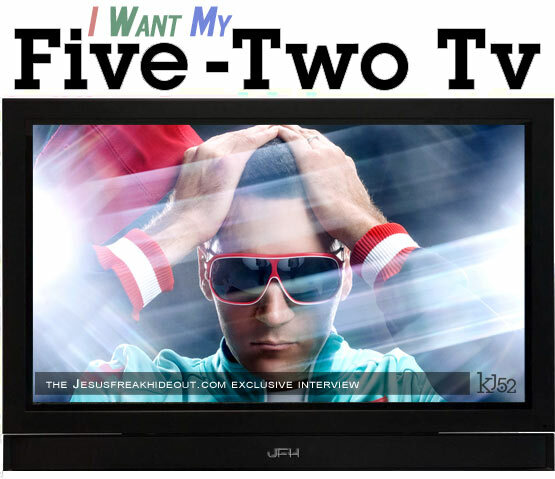 KJ-52's new album, Five-Two Television, is available September 22 wherever music is sold.